The short life of English composer George Butterworth stands as a tragic testament to the terrible cost of war, and the very real impact it has on culture and classical music. A contemporary of Gustav Holst and close friend of Ralph Vaughan Williams, Butterworth was one of the most promising young composers in the country when the First World War broke out in mainland Europe. He dutifully enlisted to serve his country in the conflict and paid with his life on 5 August 1916, when he was shot by a sniper during the Battle of the Somme. He was just 31 years old. Butterworth’s compositional style drew inspiration from the beauty of the natural world and traditional folk song, cultivating a contemplative, quintessentially English voice, full of pathos. 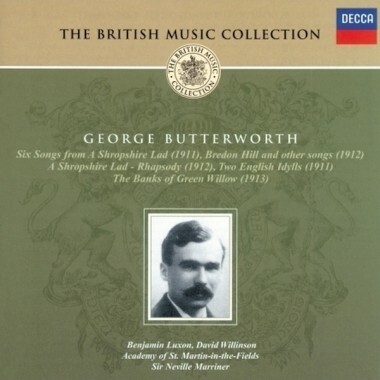 This recording combines the Academy’s 1975 recordings of A Shropshire Lad, Two English Idylls and The Banks of Green Willow with Butterworth’s song cycles Six Songs from A Shropshire Lad and Bredon Hill and other songs, performed by baritone Benjamin Luxon and pianist David Willinson. These are the works, composed in the space of three years between 1911 and 1913, which marked him out as an exemplary talent, ensured his place in the history of English music, and offered a tantalising glimpse at what might have been had he survived the war to continue composing.